This family friendly home has spacious living & dining areas & all home comforts, a well equipped kitchen & laundry. 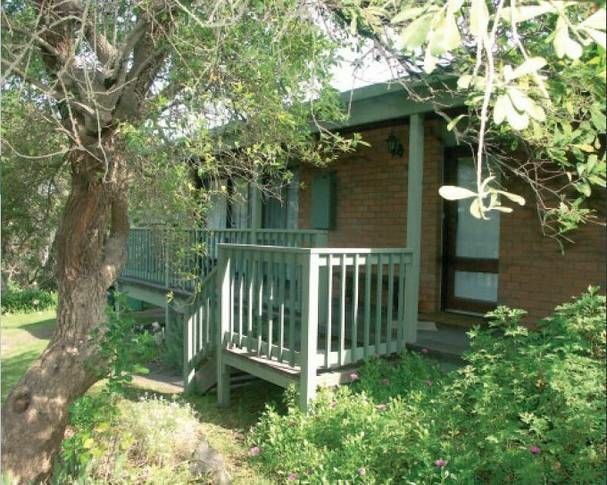 Ample parking for car/boat on treed 1/2 acre tranquil bush setting. Ducted heating, ceiling fans, LCD TV, DVD, VCR, d/w, washing machine, dryer, microwave, BBQ, outdoor setting & carport. Linen & towels provided. Bedrooms 1 and 3 have queen sized beds and bedroom 2 has a double bunk plus a single bed. There is also a double sofa bed in the lounge. When you are booking for 2 people we presume it's for 2 people sharing a queen size bed. Please notify us if this is not the case, as an additional fee may apply for additional bed/s, or for a child in a queen size bed. It's only a 400metre walk to the bay beach, and 1.4km to the ocean beach. This is a non smoking property. Please use outdoor decks for smoking. Shower over bath, wc and wash basin with cupboards and drawers. Large mirror..
View of Port Phillip Bay from front deck. Beds made up with all fresh linen. Room for 3 cars and boat. Towels provided plus bath mat and hand towel. Hand soap. Air freshener, toilet cleaner and sink cleaner provided. Sofas, TV, DVD, VCR, bookcase with books, study desk and chair. Washing up liquid, dishwasher powder and rinse aid for dishwasher. Start up tea, coffee, sugar, milk, coffee maker capsules. Oil for BBQ, tomato sauce, BBQ sauce, salt, pepper, cling wrap, aluminium foil and paper towel. Tea towels, chux provided. Fly spray provided. A variety of books for loan for all ages with facility to swap books of similar value. Verandahs front and back. Front verandah has bay view from driveway end. 2 body boards for loan. Birdsongs is a natural and tranquil location on half an acre of natural bushland, within 5 minutes walk to beach. Children love to play their games in the garden. Natural wildlife, possums and prolific bird life. We had a very comfortable stay. It was close to amenities but tucked away among the trees, very quiet and private. Thankyou for being such considerate guests. We are glad you enjoyed your stay and were comfortable. We at Birdsongs Sorrento hope that you stay again. Lovely,comfortable home a walk from the bay surrounded by beautiful trees . A great place to relax in.Very private and comfortable.Only recommendation would be to change locks as main bedroom one doesn't work and others not good.Mattresses need replacing too as too soft to be able to sleep well. Our family of four ( two grown up kids) loved our stay at Birdsongs. It is a classic 70’s beachouse with exposed beams and verandas front and back. Close walk to beach and lovely treed block. We found it had everything we needed- comfy couches, good beds and linen, plenty of crockery and cutlery. If you want modern sleek design this is not it. If you want somewhere that feels warm and welcoming and like home Birdsongs could be your place. Found the owners excellent to deal with. Thanks for a great stay! Lovely setting, good place to relax. We had a little trouble with the key lock....but once inside was most impressed. thanks Kevin & Linda for letting us share your home.